Kendubilva is a small village near to LORD Jagannatha Kshetram Puri , and 25 kms to Bhuvaneshwar . This is the holy place where the great devotee Jayadevar appeared . The village became more prominent and famous by the presence of the great devotee Jayadevar for his devotion to the Supreme Lord . Jayadevar learnt all the Vedic scriptures at an young age . He was complete into devotional services . Always immersed in Lord’s divine leela , he ignored material wealth or associations. When he came of marriageable age, his parents were searching for a bride so as to bring him into family fold . Jayadeva’s was not keen in entering family life . He remained all alone, always in thoughts of the great Lord Jagganatha divine pastimes and avoided family commitments . His parents pleaded him to get married as they were getting old . Jayadevar continued his devotional services going places , His parents were getting old and passed away. Jayadevar was now all alone. He moved away and resided near to the temple and was performing srimad bhagavath parayanam. He lived on Unchavrutti accepting what Lord Jaggantha sends him through his devotees He was with niyama performing his karmanustams and was steadfast in his activities. But Lord Jagganatha had other ideas. Near to the village , there was another devotee by name Devasharma. Devasharma prayed Lord that if he had a son he would offer him to Lord to perform devotional services in the temple of Lord Jagannatha at Puri..
Lord , however graced him a with girl child. The bubbly child was named Padmavathi. She was trained in all household chores and devotional service from her childhood. 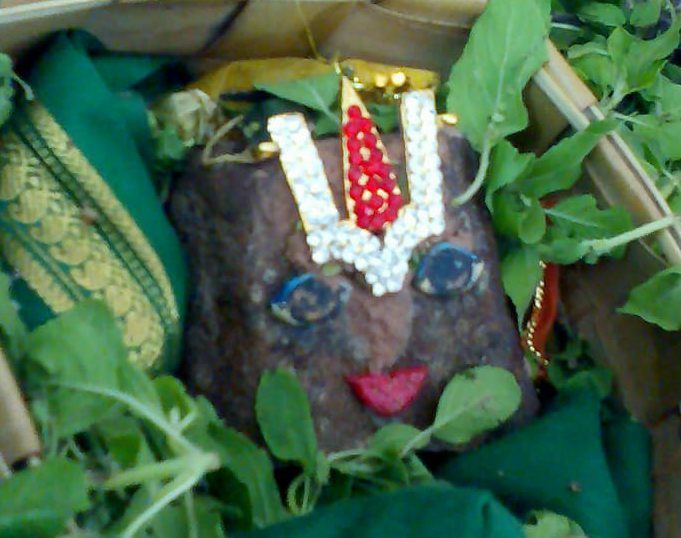 Padmavathi came of marriageable age. He proceeded to Sri Jagannathar temple and prayed LORD as to what he could do to fulfill the promise he made as he had a daughter who will not be allowed inside the temple for HIS service . He prayed Lord !!! I dont know the way, how will you take this girl, he asked with tearful eyes. Being tired he slept that night near the temple. Lord appeared in his dream and said, “Oh Devasharma ..
We appreciate your bhakthi, and will definitely take your daughter for our services and will tell you the way how. Me and my devotee are no different. As you only wanted to perform the service , well………., you can do the same to my devotee for a long long time. Our adorable devotee is Jayadevar who is living very near to you . Please approach him and accept him as your bridegroom. Give Padmavathi in marriage to Jayadevar”. Having heard this Devasharma was quite pleased that his prayers are fulfilled. He returned to his village. LORD has given his blessings and mentioned the name of her husband. He proceeded to the ashram of Jayadevar and introduced himself . He requested Jayadevar to accept his daughter as his wife . Jayadevar a sincere devotee did not argue or answer him . He just left looking walking towards temple . Devasharma however did not feel bad as he had faith in LORD’s instructions . Look there , the effulgent face with divine look who is walking towards the temple .. ..Yes he is your husband henceforth . Its Lord Jagganthar’s sankalpam that you be married to him for a divine cause . Padmavathi obeyed her father’s instructions implicitly. Normally Jayadevar would rise early everyday, have his bath from the nearby stream . He would perform japa and walk back to his Ashram . Jayadevar after finishing his japa would return and see everything in the ashram transformed . Very much surprised , he believed some devotee is serving Lord . The services continued and a month passed by. Jayadevar liked his ashram being kept clean and neat and being a brahmachari he appreciated this very much. He felt the need to inquire and find out all about this and once identified who it was he wanted to do something in return for the favor and if she had any desires he wanted to bless her with that. Jayadevar hardly had looked at her He now inquired about her name and where she was from and what she wanted and the reason why she was serving this ashram. His questions were without any preamble just like Dasaratha had asked Vishwamitra. 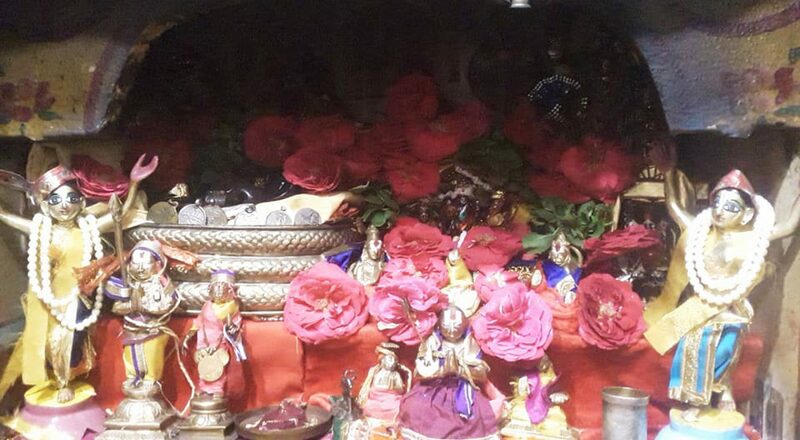 Padmavathi replied that she always wanted to do some service to Lord Jaggantahar for a long long time and serving his devotee will make her LORD more happy. He then understood why such a question had been asked by him and why such an answer was received as probably the bhagawan‘s wish. He understood the divine motive of the Supreme Lord . Jayadevar went to Padmavathi’s father and requested his daughter to be given in marriage to him. Jayadevar’s coming was known to the brahmanan as he was sure that it was bhagawan’s sankalpam and it will definitely happen one day. Marriage happened between Padmavathi and Jayadevar. They both performed LORD JAGGANATHA service ( Krishna seva) together. The ashram now became a Griham. Sadhu seva, Bhagavath kainkaryam was being done as this is the main activity of a Grihasta. Jayadevar started to understand what Bhakthi fully was. Now as the Bhakthi became more like a rasam, Jayadevar started to like it very much and he started to appreciate Padmavathis kainkaryam, he also started to like the various rasams described by padmavathi and his bhakthi started to blossom tenfold. While performing abhishekam, Jayadevar would pour all of the abhishekam ingredients at once on top of the deity of Lord Krishna . Swami …..“Why dont you offer the milk , water slowly as Sri Krishna would become breathless with your action. Thus, Jayadevar started to like and understand the suggestions made by Padmavathi very much as he started learning the loving ways of performing kainkaryam to the bhagawan. While adorning the dresses to the Lordships ( Vasthrams ) , Padmavathi would give some suggestions on how to tie the vastrams differently as she now said, ‘instead of the same blue black vastram, you can put the yellow one and the red one here on the top and see how nice it looks’.
. Jayadevar started to think, ‘oh thats a good idea, why did I not think of that before’. 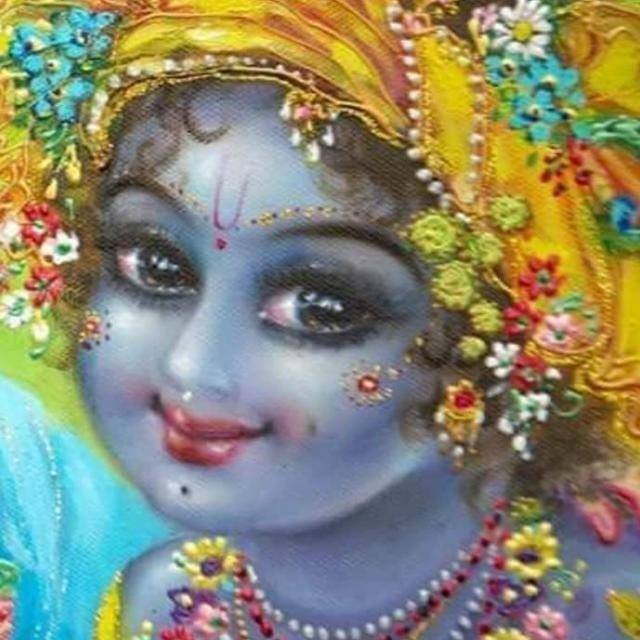 He felt that Padmavathi was showing the way to him to bhakthi rasam and as Padmavathi started singing, Jayadevar, himself being a poet, his poetic instincts started to flower. Because of his poetic instincts, Krishna bhakthi and the support from Padmavathi his heart started to pour kavyams. This Kayvam in the form of Gita slokas started flowing and he started to teach Padmavathi how to dance. The young couple were more of Prema Bhakthas. Jayadevar considered Padmavathi not as his better half but as a Krishna dasi. Padmavathi in turn feels herself as Jaya and Jayadevar as padma and they were like two sakhis for Sri Krishna. Both of them dancing in front of Sri Krishna, their shringaram was like Bhakthi shringaram. Not like the worldly shringaram. Jayadevar thinks in his mind that Sri Krishna in order to pacify Radha rani would request to place her lotus feet on his head. He thinks this is not correct as ‘Radhai (jeevatma) keeping her feet on the head of the paramatma’ is incorrect . Jayadevar is perplexed at this. This poem is not Jayadevar’s, its just coming on its own from his divine thoughts . Jayadevar decides to write this, but then he puts the pen down confused . Thus he does many times not getting courage enough to write it. He never thought of Radha as a separate but rather as a Bhaktha, Gopikai and thats Bhaktars anyway. For all the devotees , Lord Sri Krishna’s respect for their Bhakthi is also true . But Jayadevar had a little hesitation. Jayadevar thinking so decided that in this part, ‘I need to modify with some other phrase’. Thinking thus, he went to perform his usual Thaila Snanam (oil bath). Padmavathi who was alone in the house , heard her name being called “Padma” and as she turned to see, she saw that he has already come back. I suddenly remembered a sentence, and hence wanted to write in the poem otherwise I would forget it. That’s why i came so early. Please bring that palm leaf’. He took the leaf and then in his beautiful handwriting started to write the verse he did not want to write initially. Then returning the palm leaf to padma and asking her to keep it back, he left. He asked Padmavathi, my dear please tell me ‘Who wrote this verse ? Swami ‘Did you tell your feelings to anyone else or me anytime’. Jayadevar said, ‘No! this should not be said, its a divine secret . Swami ‘Whoever was in your heart only would have written this then’. He saw the palm leaf repeatedly ..the handwriting and the words written were like pearls and he touched them with his eyes. Lord had accepted his words for that sentence. Not only that, the entire Gita Govindam was accepted. My dear “Padmavathi, you are blessed one! With tears he said …. Your devotion is flawless and that’s the reason LORD appeared . Recollecting the divine incident tears flowed down her face. Gita Govinda is centered around 24 Ashtapadis (songs with 8 couplets). The Ashtapadis are about different moods of love between Lord Krishna and Radha…. Some are almost in form of hymns, listing Lord Krishna’s achievements in his various incarnations …….. Some others are the words of messengers sent to each other, urging mercy and to swallow pride. The King of Ascetics ........ "KashAya sobhi kamaneeya sikhA nivEsam .. dandatraya ujjvala karam vimala upaveetam ... udyat dinEsa nibham ullasat oordhva pundram roopam tavAstu yatirAja drisOr mamAgrE"
" RISHIMUKHA PARVATAM " the holy place where Sri Rama bhaktha Hanumanji met Supreme Lord Rama and Lakshmana for the very first time.